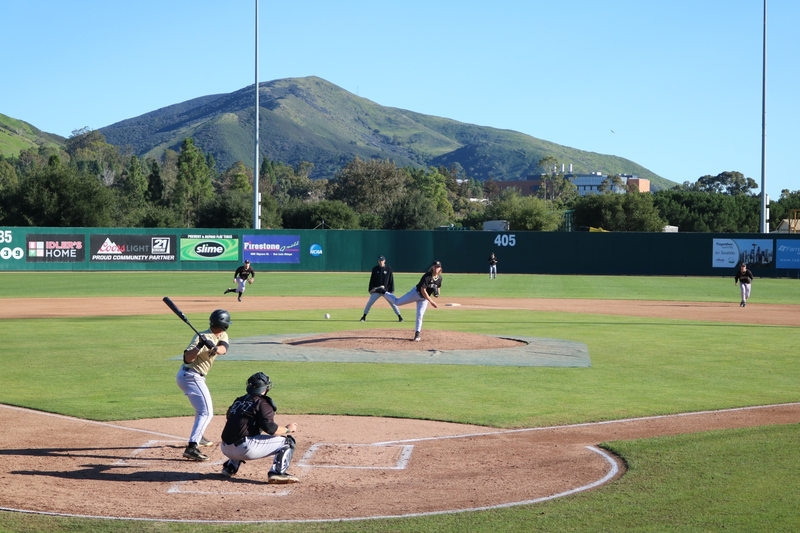 The Cal Poly Baseball team returned to the spotlight as they kicked off their season against Oklahoma on Friday, Feb. 15. Oklahoma took the 3-0 series win against Cal Poly, but the Mustangs still look forward to a successful season. The Mustangs, who finished 15-9 in the Big West Conference last year, are projected to place fourth this season. Junior infielder Dylan Doherty is looking at the fourth place projection as motivation. The Mustangs have grown a reputation for starting slow and finishing strong in recent years. The Mustangs went 12-20 in the 2017 season’s non-conference round of play and finished second in the Big West with a 16-8 record. They followed a similar pattern in 2018, starting slow with a 15-18 record in non-conference play before picking up the pace with a 15-9 record in conference play for another second place finish. The Mustangs narrowly missed the postseason in both years, as only the first-place team in the Big West Conference moves on to the NCAA tournament. Cal Poly appeared in back-to-back NCAA Tournaments in 2013 and 2014. While it may seem to hold less importance than conference play, a shaky start in non-conference games can easily lead to teams into a difficult position. The team is in wide agreement on what they need to work on this season in order to finish strong: pitching and defense. Ay, a right-handed pitcher who sat out most of the 2018 season due to injury, will be returning to the mound this season. Past game scores and statistics aside, the Mustangs are confident in their lineup for the season, which includes 12 new players. “The past couple of years, we had some star players or big name guys, but this year we have a good collective group as a whole, so I think we’re gonna do pretty good.” Doherty said. The Mustangs will have a different look this season, as Cal Poly juniors Alex McKenna and Nick Meyer were selected in the 2018 Major League Baseball Draft. McKenna, a center fielder for the Mustangs, was selected in the fourth round of the draft by the Houston Astros. Meyer, a catcher for the Mustangs and the 2018 Big West Defensive Player of the Year, was drafted by the New York Mets. The Mustangs welcome a number of players fresh out of high school, and the team holds high hopes for the newcomers. “A couple freshmen have come in and really shown what they’re made of,” Ay said. Even with the loss of two All-Big West first team players in McKenna and Meyer, the team still feels confident in their ability to succeed this season. Junior catcher Myles Emmerson finished the 2018 season with a 0.322 batting average in 22 games while starting in 16 games. Coming together as a team, the Mustangs feel their chemistry on and off the field will be a huge factor in their success this season. “One thing that surprised me coming in was all the guys bringing me in with open hands,” freshman infielder Willie Cano said. Cano will be entering Baggett Stadium for his first season at Cal Poly as a potential second base starter. The Gilbert, Arizona native finished his senior year at Mesquite High School with a 0.468 batting average. Out of the 128 times Cano stepped up to bat, he only struck out eight times. On top of the team’s chemistry, the players have a notable mentality that allows them to stand out among other top contenders. The Mustangs will stop by CSU Bakersfield for one game on Tuesday, Feb. 19, followed by a three-game series hosted at Cal Poly’s Baggett Stadium versus the University of California, Berkeley, starting on Friday, Feb. 22 at 6 p.m.